Yadkinville, NC -- The quality and diversity of North Carolina's traditional music scene will be on display during the third annual Sounds of the Mountains concert series in January at the Willingham Theater in Yadkinville, North Carolina. The series is a collaboration between the Blue Ridge Music Center and the Yadkin Cultural Arts Center The performances will feature old-time mountain music, progressive bluegrass, and contemporary Americana with some of the Old North State's best roots and traditional performers including Chatham County Line (Raleigh), The Jeff Little Trio (Todd), and the Snyder Family Band (Lexington). 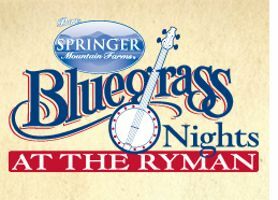 Owensboro, KY - The International Bluegrass Music Museum announced the schedule for their fall benefit concert series slated to begin August 26 and continuing through the month of December. The series will feature seven bluegrass and folk bands from across the United States starting with Mipso, a four-piece out of North Carolina on August 26.